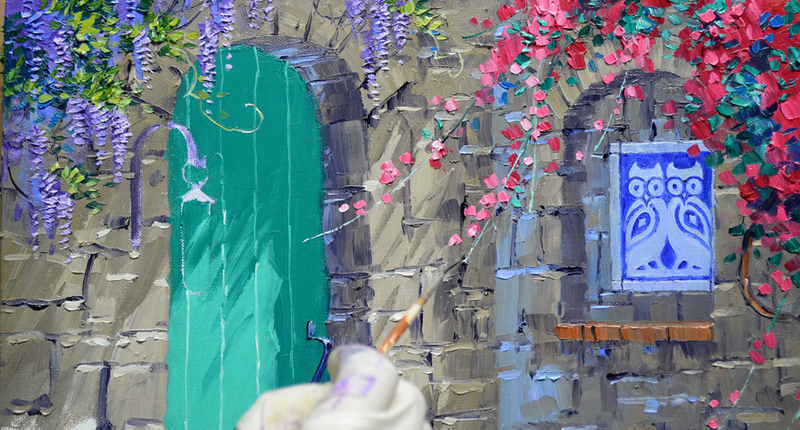 The long, dangling blossoms of the Wisteria are made of mixtures of Dioxazine Purple + White and Dioxazine Purple + Ultramarine Blue + White. 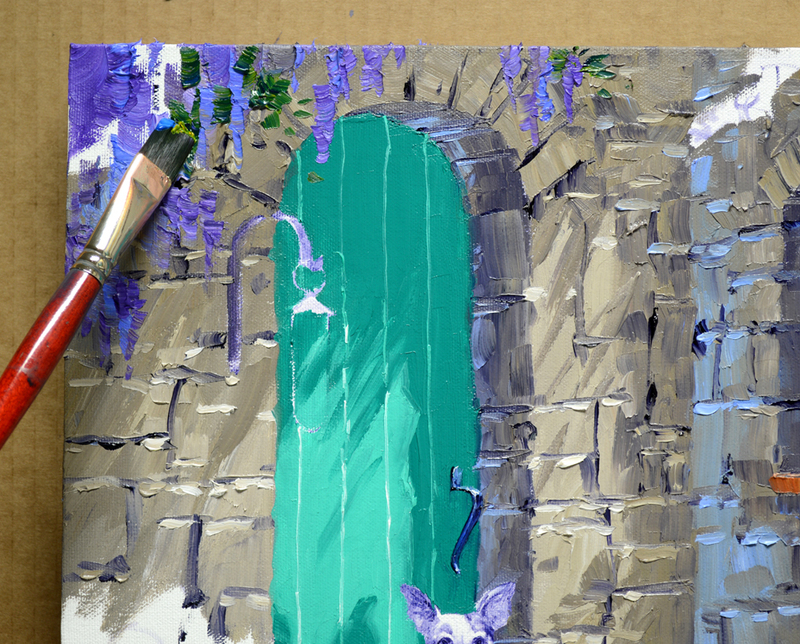 Foliage is then painted around the Purple flowers with several shades of Pthalo Blue + Cadmium Yellow Medium. The Bougainvillea is painted with another special color, Permanent Rose. White is added in various proportions to make the lighter bracts. The pink parts of this plant are called Bracts, the tiny white flowers are actually located inside the pink globes and are not visible here! Leaves are mixes of Viridian Green + a touch of Cadmium Yellow Medium + White. The entire floor is painted, establishing the light and shadow areas. Then perspective lines separating the tiles are dragged into the wet paint with a fine brush. 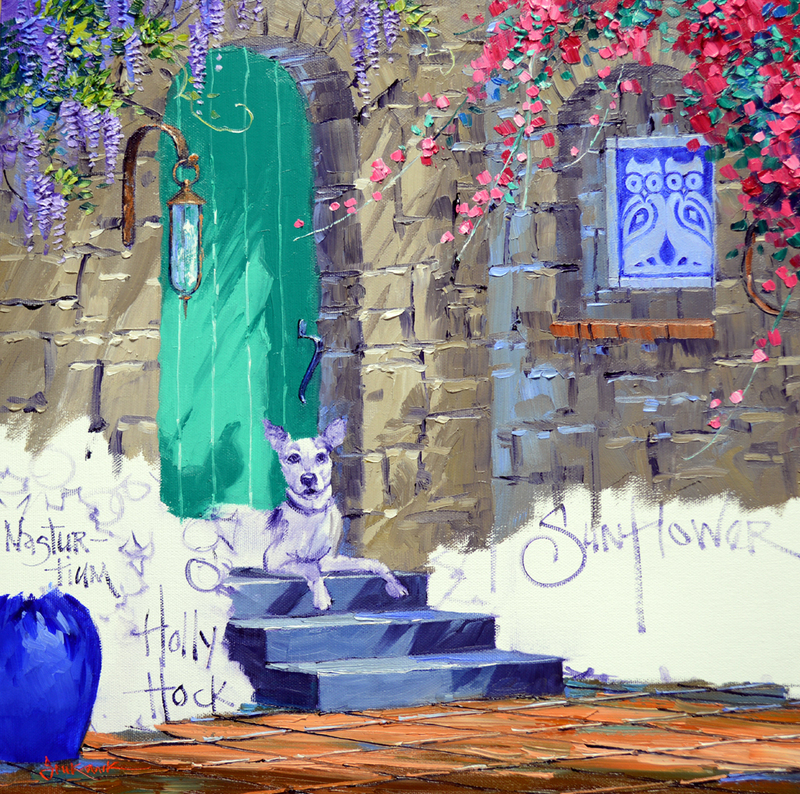 Combinations of Ultramarine Blue + Cadmium Orange + White are used for the steps. 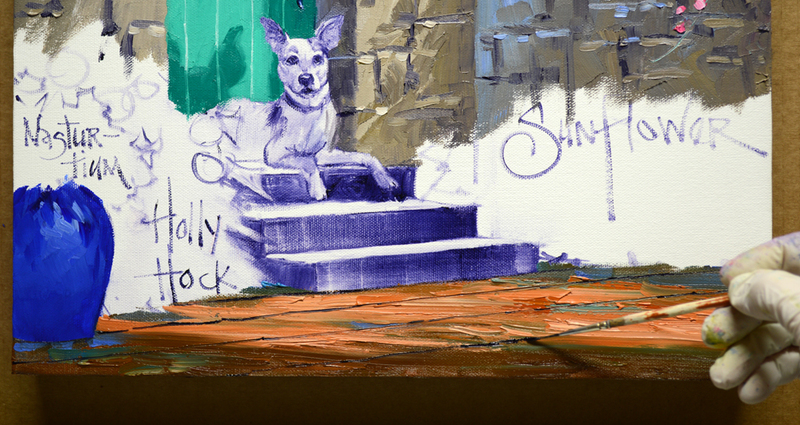 The darker mixtures are made by adding MUD (2 parts Ultramarine Blue + 1 part Alizarin Crimson). The upright part of the step, the riser, is always darker than the top surface. This is because the sun from above hits the top plane directly, making it lighter. This entry was posted on January 11, 2019 at 6:24 PM and is filed under Original Oil Paintings. You can follow any responses to this entry through the RSS 2.0 feed. You can leave a response, or trackback from your own site. Hello Mikki..what colour can i use if i dont have permanent rose?will alizarin crimson work ?